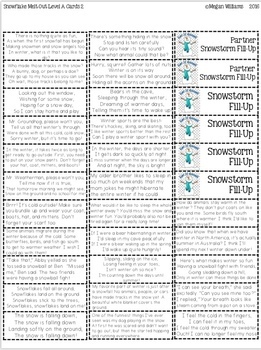 This product gives you a snow/winter themed partner game designed to help students practice their reading fluency. 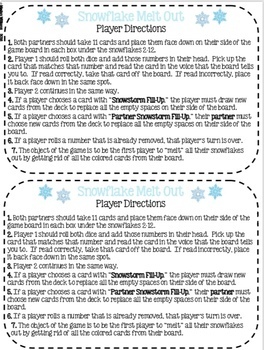 The object of the game is to be the first player to completely clear all the cards off his/her side of the board by successfully reading the cards in a voice that matches the number they rolled. By varying where the cards are placed on the game board, no two rounds of the game will be the same! There are 2 different sets of cards included, so that you can differentiate the game based on your students’ reading levels. The first level includes original poems/sentences about snow, hibernation, hot chocolate, snow days, and other winter things. The second level are phrases I put together from the Fry List of Words. I also included a blank template if you’d like to write your own cards. Both color and black and white versions are included for your preference. This game is perfect for centers or Daily 5 rotations. 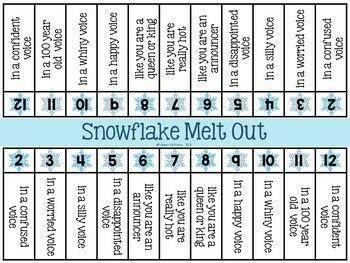 What a fun way for students to practice their reading fluency! 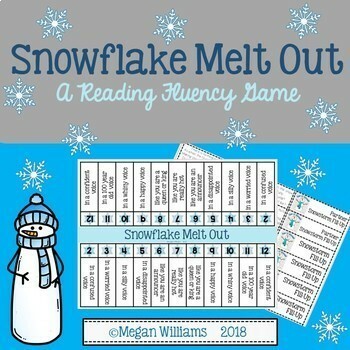 If you're looking for more Reading Fluency Games, please feel free to check out my store!